Eat Your City: The Free Press Bistro, Edmonton, AB - Tasty chip butty - french fry panini! The Free Press Bistro, Edmonton, AB - Tasty chip butty - french fry panini! 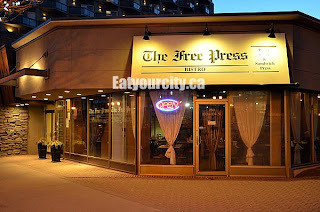 With a craving for a homestyle and yummy sandwich, we dropped by on a weeknight to try out the Free Press, as they're well known for having some of the best sandwiches in the city. Dropping by for supper was a great idea, as its not as crazy busy as it is during lunch hour. The soft browns and warm woods set an inviting and cozy atmosphere, and several regulars stopped by to order sandwiches (some which weren't on the menu anymore, but Chef Natalie was more than happy to whip up). On to the food! 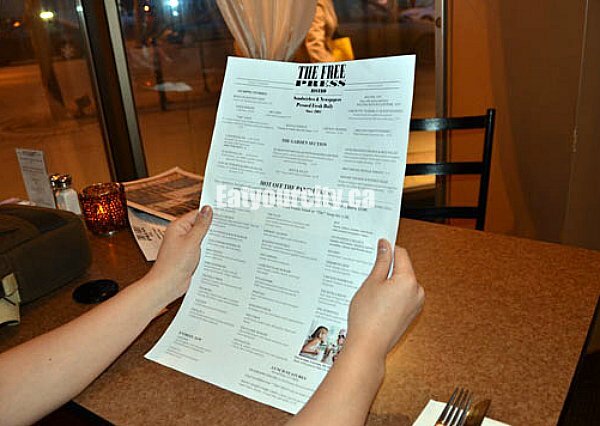 We were amused with the menu printed to look like an old school newspaper - a fun whimsical touch. 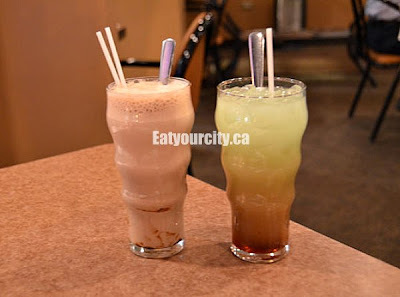 Egg Cream on left and Lime Rickety on Right. They tasted better than they look! Under the appetizer section, this was quite a large appy for two to share and still have room for our sandwich entrees. 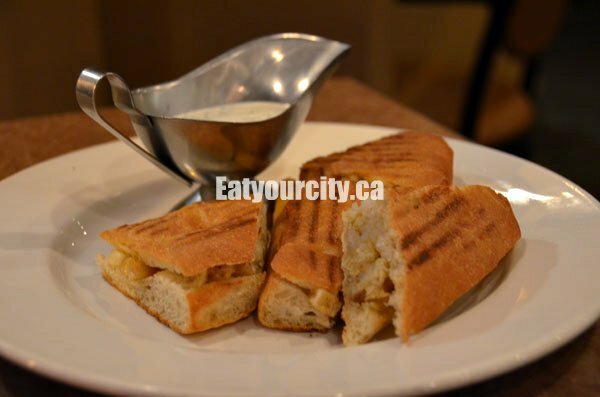 Touted as a UK fav - 4 french fry filled paninis are held together with a touch of mozza and served with a lemon-dill alioli. Awesome, but needed much much much more cheese. The alioli was surprisingly very bland and runny... needed more fresh dill and lemon to wake things up a bit. 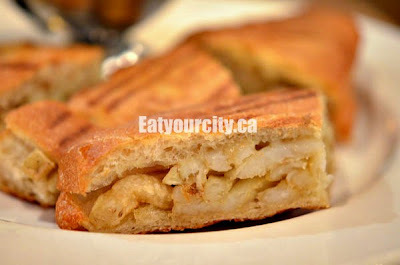 And a close up of having yes, french fries in your panini! 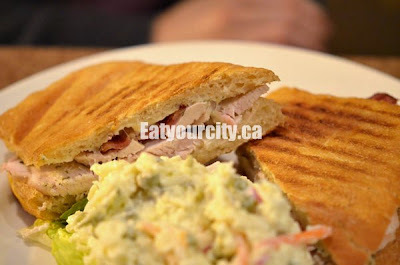 A roasted chicken breast club made with lemon dill alioli and cheese. It was a very healthy tasting sandwich as the bacon tasted like turkey bacon, lacking the salty-smokiness I was expecting it to impart to the bland moist roast chicken breast. I usually eat low sodium, and this sandwich would fit the bill. The cheese was a mild white variety, with only enough to keep the chicken moist but not enough to impart any flavor. The alioli was the same one used in the chip butty, so again was lacking the acidity and zing to really make this sandwich shine. Ironically, the tasty potato salad side I chose to go with it was very tangy and dotted with peas (which I initially thought was capers as the salad was so pickle-y tasting). I was tempted to shove some of the potato salad inside my sandwich to punch up the flavor. This was more like a huge wad of pulled beef than a sandwich, so persons with big appetites rejoice! The steak was cooked well done, pulled and pressed together with onions, a few strips of red bell peppers... all held together with a touch of Dijon mustard and mozza. Tasty and very filling, though it could have used a bit more cheese and sauce. 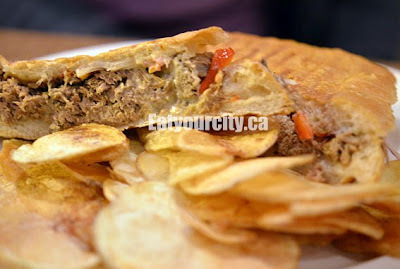 Served with addictively good housemade potato chips. We had finished off most of them before we thought of asking for some malt vinegar. Whoops.. yum! 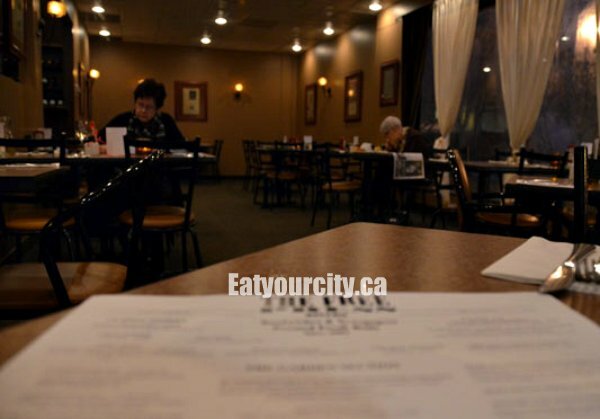 Overall, a tasty sandwich place with down to earth and super friendly staff. Next time, I have my eye on the Reuben! Food Blogging 101: Our own meme!